Vrindavan Chandrodaya Mandir celebrated Holi Mahotsav at Gurugram on Sunday, 17 March 2019. Part of its Gaura Purnima celebrations the event offered a unique opportunity for participants to play ‘Phulonki Holi’ with the Lord Himself. The event was conducted at Amour Coventions and Resorts, Sohna Road, Gurugram. 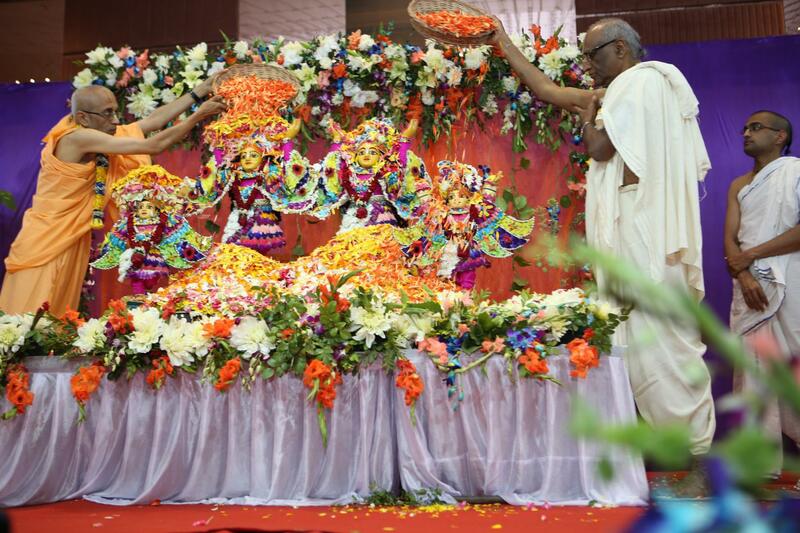 The programme began at around 5:30 PM with Pushpa Abhisheka of Their Lordships Sri Sri Gaura Nitai. 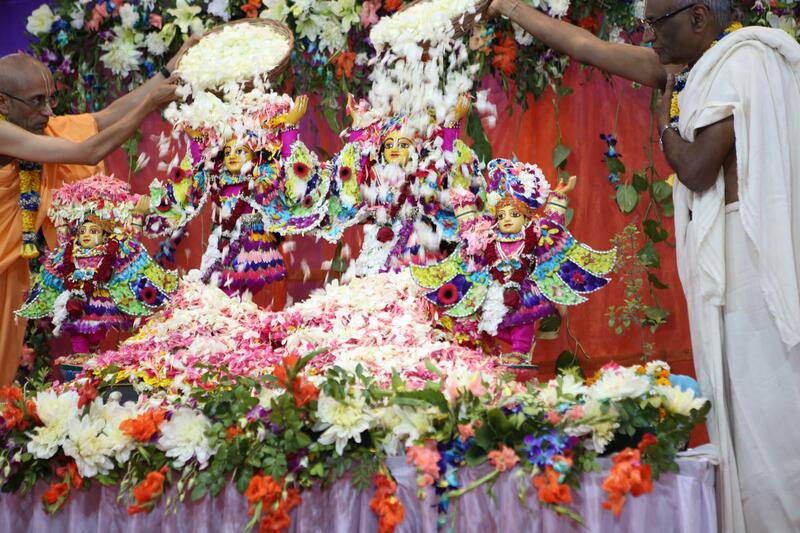 Varieties of flowers were showered on the Deities followed by offering of different kinds of lamps. 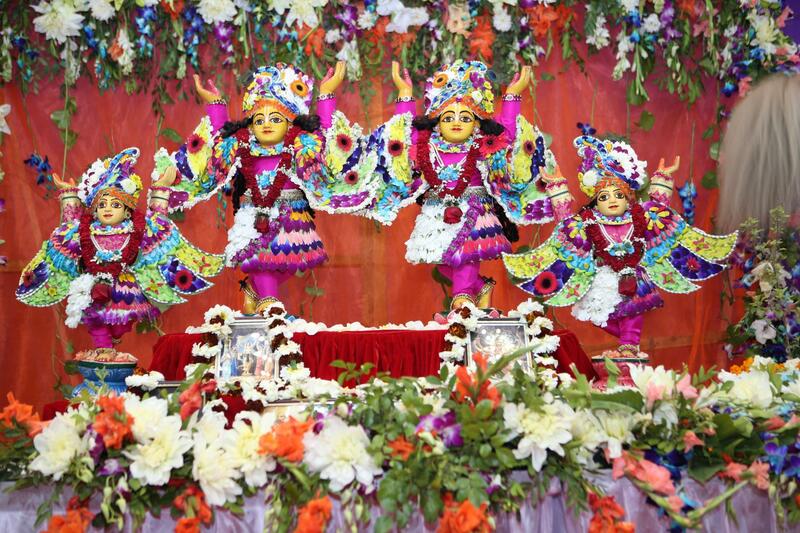 Throughout Sankirtana was performed and all devotees clapped and danced joyfully. Then His Grace Madhu Pandit Dasa, Chairman Vrindavan Chandrodaya Mandir spoke on the importance of Holi and the glories of Sri Chaitanya Mahaprabhu whose appearance is celebrated as Sri Gaura Purnima. “The appearance of Lord Chaitanya is a critical event in history which turned the course of civilization to the exalted precepts of pure devotional service to Lord Krishna,” he said. The Deities were then taken on a palanquin ride around the hall and all devotees showered varieties of fragrant flowers on Their Lordships. As the sound of Sankirtana rent the air, an atmosphere of devotional joy swelled in the room. The event concluded with distribution of Mahaprasadam. It was an ecstatic evening of ‘Phulon ki Holi’ at the Vrindavan Chandrodaya Mandir’s Holi Mahotsav celebrations in Gurugram.